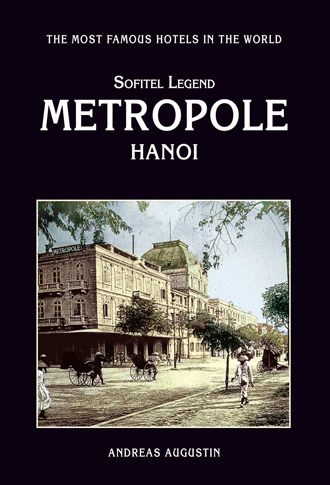 What else happened in the world in 1901, the opening year of Hanoi’s “Grand Hôtel Metropole”? In Hanoi the city officials decide to build an Opera House. In South Africa as Boers continue to demand autonomy. United Kingdom, Germany and Japan protest at Sino-Russian agreement on Manchuria. United States President William McKinley begins his second term. Theodore Roosevelt becomes Vice President of the United States. Irish nationalist demonstrators ejected by police from House of Commons of the United Kingdom in London. In Bremen, an assassin attempts to kill Emperor Wilhelm II of Germany. New York State becomes the first to require automobile license plates. The U.S. stock market crashes. Iran (known as Persia until 1935) grants William Knox D’Arcy a concession, giving him the right to prospect for oil. Katsura Taro becomes Prime Minister of Japan. Cuba becomes a U.S. protectorate. The 1,282 foot (390 m) covered bridge crossing the St. John River at Hartland, New Brunswick, Canada opens. It is the longest covered bridge in the world. O. Henry, an American writer, is released from prison in Columbus, Ohio after serving 3 years for embezzlement from the First National Bank in Austin, Texas. Peter O’Connor sets the first International Association of Athletics Federations recognised long jump world record of 24 ft 11¾ins. The record will stand for 20 years. Discovery Expedition: Robert Falcon Scott sets sail on the RRS Discovery to explore the Ross Sea in Antarctica. Hubert Cecil Booth patents an electric vacuum cleaner. In Hanoi, the Grand Hôtel Metropole opens its doors. The Boxer Rebellion in China ends with the signing of the Peking Protocol. Theodore Roosevelt becomes President of the United States following the assassination of William McKinley. He becomes famous for his phrase, “Speak softly and carry a big stick”. The Royal Navy’s first submarine is launched at Barrow. Auguste Deter is first examined by German psychiatrist Dr Alois Alzheimer, leading to a diagnosis of the condition that will carry his name. The first Nobel Prize ceremony is held in Stockholm on the fifth anniversary of Alfred Nobel’s death. Guglielmo Marconi receives the first trans-Atlantic radio signal, sent from Poldhu in England to Newfoundland, Canada; it is the letter “S” in Morse.